TRY growing tomatoes, courgettes or other cucurbits, or citrus in warmer areas, and you’ll almost always come across them. And they can be hard to control. Several species of whitefly are pests in New Zealand but there are two in particular that many gardeners have to contend with. Greenhouse whitefly adults on the undersides of courgette leaves. Known worldwide as the greenhouse whitefly, Trialeurodes vaporariorum causes problems here, both outdoors and in greenhouses. Thought to originate from around Central or Southern America they were first reported in greenhouses in England in 1856 and the United States in 1870, and probably arrived here on imported plants with early immigrants. In our relatively mild climate they thrive outdoors in many areas. The adults are about 1.5mm long and usually found congregating under the leaves. 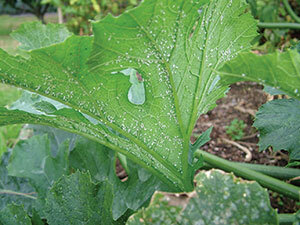 A badly affected courgette leaf can have hundreds of them sheltering under there and if disturbed they’ll take flight. It’s not much fun getting a face full of whiteflies when picking the zucchinis. Greenhouse whitefly adults on the undersides of tomato leaves. While greenhouse whitefly seems to have been here almost forever, a much more recent introduction is now causing concern. The Australian citrus whitefly, Orchamoplatus citri, was first reported in 1990 in Auckland and is now widespread throughout the North Island in all the main regions where citrus is grown. In appearance, there’s not a lot of difference between these two whiteflies but they are different species and stick to different host plants. If you have whiteflies on your lemon tree and whiteflies on your tomatoes, you will have two different species of whiteflies each keeping pretty much to their own range of host plants. Both these whiteflies lay tiny eggs on the undersides of the leaves which hatch into larvae, known as crawlers, that don’t actually move very far they just sit there sucking sap from the leaves and out their rear ends exude honeydew which drops on to leaves and fruit below. The sweet, sugary honeydew soon becomes infected with sooty mould fungus, giving leaves and fruit a dirty, black appearance. Larvae moult several times, eventually pupate, then emerge as adult whitefly, and so the cycle continues. Controlling greenhouse whiteflies can be problematic as they’ve developed resistance to many widely-used insecticides, and most gardeners prefer not to spray food plants intended for the table anyway. Commercial tomato growers control them with a tiny parasitic (non-stinging) wasp (Encarsia formosa)which lays its eggs in the whitefly nymphs. The wasp larva develops inside the nymph, eventually killing it. The larva pupates and emerges as an adult wasp ready to mate and lay eggs in more whitefly nymphs. In the home garden there are several ways to keep greenhouse whitefly populations down, though you’ll probably never get rid of them completely. I used to have major problems in my vegetable garden every summer but now, by growing plenty of nasturtiums among the tomatoes and courgettes, greenhouse whitefly are almost non-existent and some of the natural predators can do their thing without being hammered by insecticides. There’s also the added bonus of juicy nasturtium flowers and leaves for the salad. Alternatively, as soon as you spot whiteflies, apply a spray such as pyrethrum, neem or Yates Mavrik, making sure you get good coverage under the leaves. It’s a good idea to spray early in the morning or in the evening as adult whiteflies are less active in cooler temperatures. You may have to spray every seven to 10 days over the heat of summer to control them. 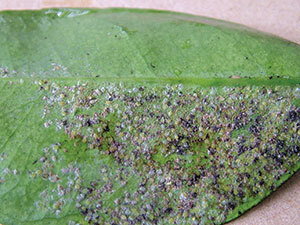 Citrus whitefly crawlers, shed skins and some sooty mould on the undersides of a grapefruit leaf. 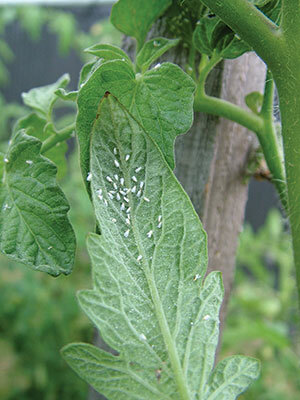 Note that one of the main sources of greenhouse whitefly is weeds in the garden. Plants such as sow thistle (puha), black nightshade and milkweed often have whiteflies on them in summer. One of the most effective ways to control citrus whitefly in the home garden is spraying with insecticidal oil such as Eco-oil, Super Spraying oil or Conqueror. These are all safe to use even when the tree is carrying fruit. Make sure to get thorough coverage of the spray on the undersides of the foliage. Spray in winter and again around October-November if you spot any whitefly.